The answer to all of your general heallth concerns. Use Rudofil to maintain healthy joints. As we get older, however, joint comfort can begin to decline, making it more difficult to live the active lives we want to live or enjoy the activities that make our lives worthwhile. Mobility is a freedom most of us take for granted.Take Rudofil to improve and maintain your joints. Mobility is a freedom most of us take for granted. As we get older, however, joint comfort can begin to decline, making it more difficult to live the active lives we want to live or enjoy the activities that make our lives worthwhile. Millions of Americans suffer from joint discomfort, and most just dismiss it as part of getting older. But joint comfort doesn't necessarily have to decline with age. There are steps you can take to improve and maintain your joints, like taking Rudofil. 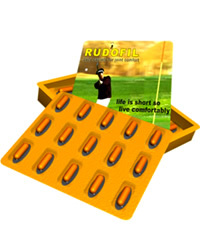 Rudofil is a non-prescription caplet for better joint comfort. If you eat sensibly and maintain a moderate weight and a healthy level of activity, Rudofil may just be the next best step toward living comfortably. If you suffer from a serious medical condition that is the underlying cause for your joint pain, talk to your doctor. But if you're looking for a natural way to regain the youthful mobility you once had, you may be ready for Rudofil. Rudofil promotes joint comfort by supplying key nutrients needed to build cartilage for improved joint function. Taking Rudofil twice a day can help support the long-term health of your joints. And Rudofil contains no synthetic drugs. Rudofil's proprietary blend of natural ingredients is specifically formulated to help restore joint comfort and help renew cartilage. It does this by supplying key nutrients for stimulating cartilage production. Say goodbye to joint discomfort and start improving the health of your joints with Rudofil.